Sevilla goalkeeper Sergio Rico has emerged as a surprise target for Liverpool ahead of the summer transfer window. According to the football transfer rumours in Spanish Media (ABC), Liverpool are keen to land Sevilla goalkeeper. The Spain international has joined Sevilla in 2006. The 23-year-old has a valid contract with Sevilla until June 2019. 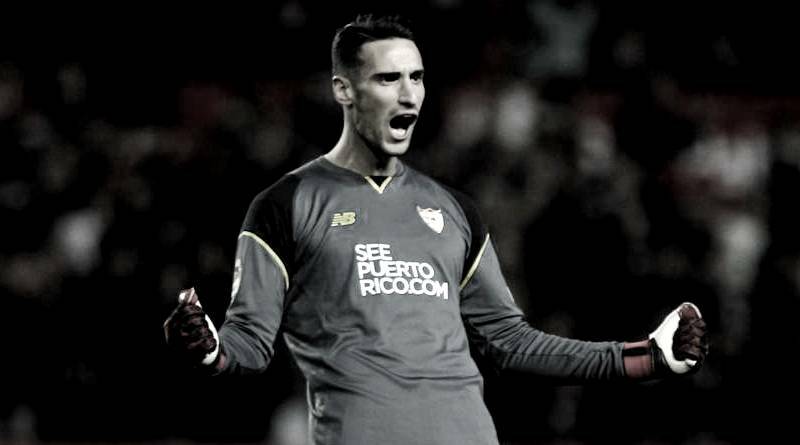 Sergio Rico has conceded 158 goals and provided 45 clean sheets in 129 games for Sevilla in all competitions. The 23-year-old is considered to be one of the best goalkeepers in Spain. The Spain international has been in impressive form for Sevilla this season. As a member of Spain national football team, Rico has won one cap. Jurgen Klopp wants to sign a new goalkeeper this summer and Sergio Rico is one of the names at the top of his wishlist. Liverpool manager wants to continue to strengthening his squad so they’re able to compete both domestically and in the Champions League next season. However, there is some talk that Jurgen Klopp could rotate his goalkeepers more next season as Liverpool look to compete on four fronts, so there could still be enough game time available for Sergio Rico if he did make the move. According to the report in the Spanish Media, the Spain international has a 30 million euros release clause in his contract with the Sevilla, but Liverpool are only be willing to pay around 12 million euros for the goalkeeper.